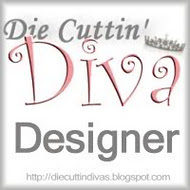 We have a new challenge this week at Die Cuttin' Divas. We want to thank everyone who entered last week's Christmas in July challenge. There were so many great entries! For my card this week, I used A Child's Year cartridge. I actually used 2 different images: Beach 2 for the umbrella cut at 3-1/2" and Beach 3 cut at 2-1/2". The umbrella had it's own bucket at the left side of the sand, so that's where I overlapped the 2 images using the bucket that the little girl has. It worked out perfectly! I used Divine Swirls embossing folder on the blue background cardstock, and Houndstooth on the sand. Handcut the banner and used a Studio G dollar stamp for the sentiment. Our sponsor this week is Great Discounts and they will donate a Cricut magazine for our giveaway this week! We hope you'll enter the challenge this week--create a card, layout, or altered project with a Beach Theme. Be sure to use a die cut and link your post back to Die Cuttin' Divas. We look forward to seeing what you create! Thanks for stopping by, and for all your kind comments! awww...what a sweet card! Reminds me of trips to the beach when my guys were little. The embossed background looks great! Great card. Love the colors. This is one of my favorite cartridges. So cute. Hi Pat! Adorable card. Love the embossing behind the image. Hi Pat! I love this beach-themed card. The colors are perfect, and nothing says beach like a child playing in the sand. I just got some new beach-y stamps, so hopefully I have time to use them and enter your challenge this week. Thanks for always visiting my blog and leaving nice comments. Hope you're having a great summer!